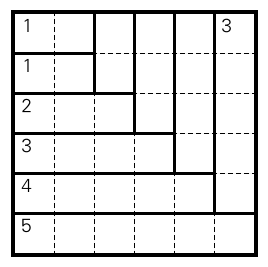 Rules Shade some cells, so that all shaded cells are connected, and such that shaded cells don’t fill any 2×2 square. 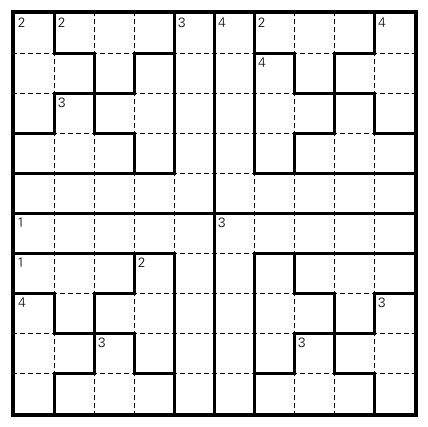 Clues indicated the number of shaded cells in an area; each area must have at least one shaded cell. Whenever two shaded cells touch across walls, the number of shaded cells within both areas must be different. This entry was posted in Puzzles and tagged medium, nanro, nanro signpost, variant on 2016-11-08 by rob. Or see the instruction booklet, with a somewhat different formulation of the rules. This entry was posted in Puzzles and tagged easy, nanro, nanro signpost, practice, variant on 2016-05-11 by rob. 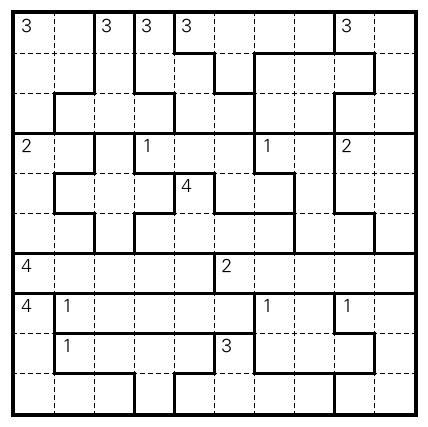 One more practice puzzle, a Nanro Signpost.